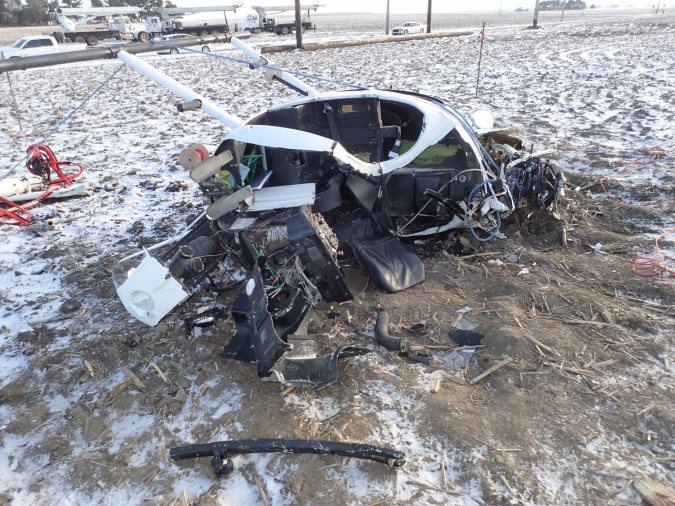 On March 14, 2017, at 1546 eastern daylight time, an MD Helicopters 369FF, N530KD, impacted terrain during a power line construction flight near Chalmers, Indiana. 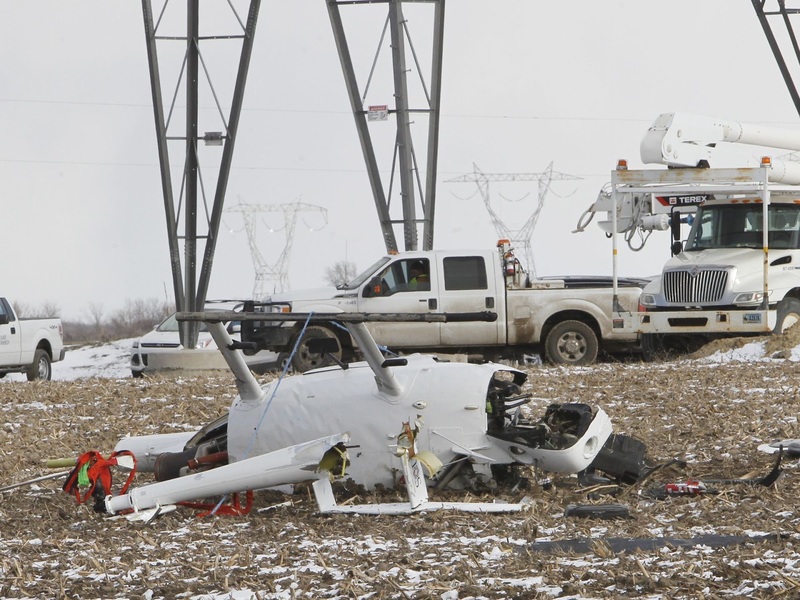 The commercial pilot was fatally injured, and the helicopter was destroyed. 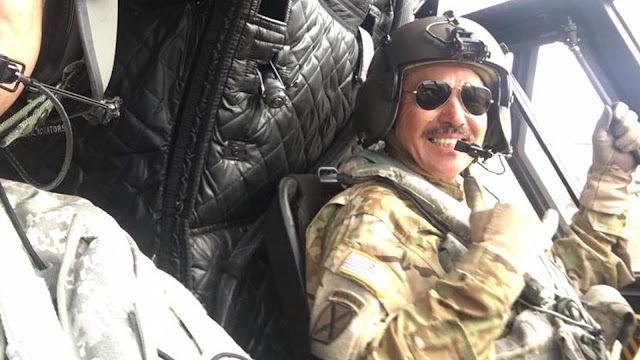 The helicopter was registered to a private individual and operated by Rogers Helicopters, Inc., under the provisions of Title 14 Code of Federal Regulations Part 133 as an external load operation. Visual meteorological conditions prevailed at the time of the accident, and no flight plan had been filed. The helicopter departed from a staging area near the accident site about 1530 for the local flight. The purpose of the flight was to thread a braided metal sock line through the center of a tower structure and pull the sock line to the next tower. The helicopter was equipped with a side pull hook assembly that attached the cargo hook to the left cabin step position on the helicopter. A 50-ft blue nylon long line with a protective sheath was attached to the cargo hook, and a grappling hook was attached to the other end of the long line. The grappling hook was connected to a large metal needle that enabled the pilot to thread the sock line through the tower structure. The needle was equipped with two hooks that were used to attach it to the tower structure. To thread the sock line, the pilot hooked the needle to the tower, released the grappling hook, moved the long line to the opposite side of the tower, and picked up the needle with the grappling hook. The tension on the sock line was controlled by a triple drum puller located about 2 miles (and 10 towers) north. Each of the three drums contained sock line for one of the three phases of the tower as seen in figure 1. The puller featured a manual brake that was operated by a power line construction employee. 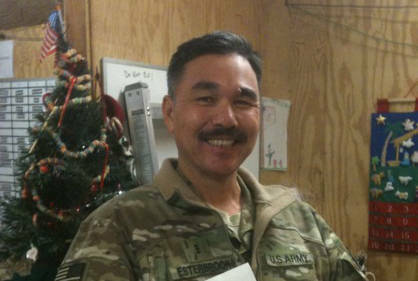 The employee and the pilot communicated via radio as the pilot would announce his operational intentions. 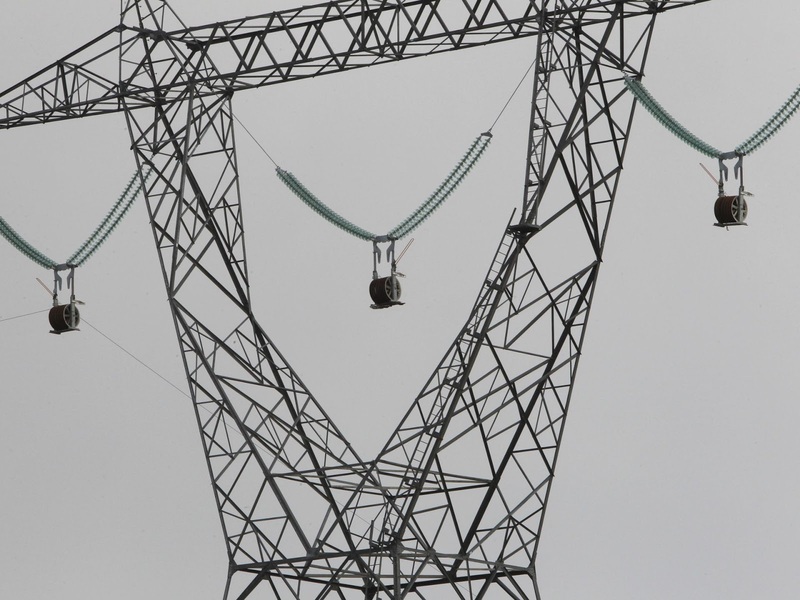 The employee stated that the pilot had threaded the sock line through nine towers. The pilot announced over the radio that he was slowing and approaching the tenth tower. The employee later heard yelling over the radio and then silence. The amount of brake applied on the sock line at the time of the accident was not determined. A witness provided a 3-minute cell phone video of the events leading to the accident and the entire accident sequence. The video revealed that the pilot was attempting to attach the needle's forward hook to the tower structure (figure 1) when the accident occurred. Review of the video showed that the pilot attempted twice to hook the needle to the tower and was unsuccessful each time. Before the third attempt, the helicopter wobbled several times. On the third attempt, the helicopter flew backward until the needle impacted the tower. The helicopter continued a backward motion, pitched up, then descended with the tailboom pointed at the ground (figure 2). The needle's aft loop, which the grappling hook was attached to, separated from the needle and was thrown to the south. While still airborne, the helicopter made a descending 180° clockwise rotation, as viewed from above, with the long line still attached. The rotation stopped as the helicopter faced north then rolled left about 80°. The long line became entangled with the main rotor blades, and then the blades impacted the top of the cabin and the tailboom. The tailboom separated about mid span, and both the tailboom and the rest of the helicopter descended and impacted the ground. There was no evidence of a post-crash fire. The pilot's personal logbooks were not found during the investigation. A review of the pilot's Federal Aviation Administration (FAA) medical certificate application indicated that, as of October 12, 2016, the pilot had accumulated 14,975 hours of flight experience, all of which were in rotorcraft. The company duty log sheets revealed that the pilot flew 336.7 hours in 2016 and 12.8 hours in 2017. 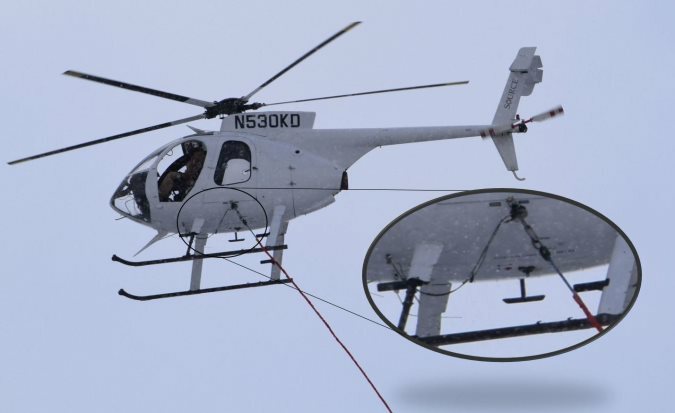 The helicopter was equipped with a Colorado Helicopters, Inc., Side Pull Hook Assembly (figure 3) per supplemental type certificate (STC) SH5230NM. 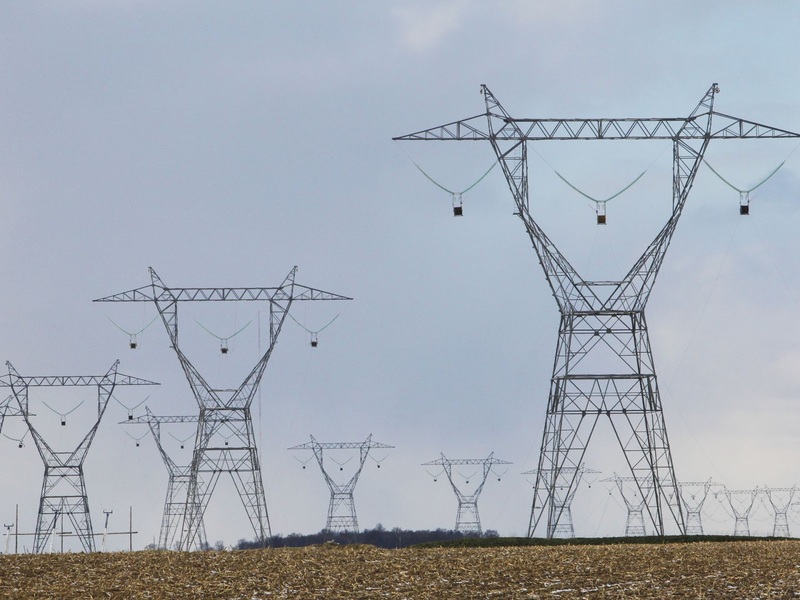 According to the STC holder, the purpose of the assembly is to quickly rig a helicopter for pulling a sock line on power line construction projects. The assembly featured mechanical and electric cargo hook release mechanisms. The system is certified for a maximum side pull load of 1,900 lbs., which is safeguarded by a breakaway swivel; the two-piece breakaway swivel is held together with a calibrated shear pin. The STC holder noted that if the airframe is about to be overloaded, the shear pin is designed to break and allow for the long line to fall away from the helicopter; no unusual attitudes will result, and the helicopter should easily come to a hover. The frame of the needle was made of steel tubing; the forward and aft sections of the needle were connected in the middle by a hinge bracket. Each section of the needle featured a closed loop with a straight open hook extending aft; the straight hooks (see figure 4) allowed the pilot to temporarily attach the needle to a horizontal cross-member of the tower and then reposition the helicopter. The aft end of the needle was connected to the metal sock line via metal carabiners and a non-breakaway swivel. The weight of the needle was about 200 lbs. 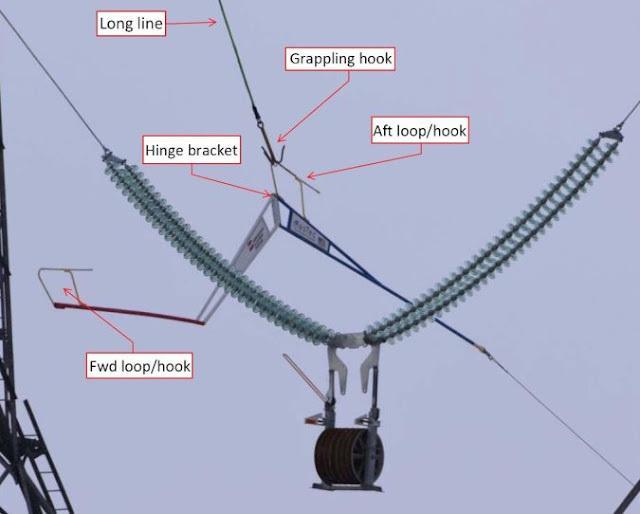 Figure 4 shows the multicolored needle connected to the long line via the grappling hook. The photo depicted in figure 4 was captured a few minutes before the accident and is indicative of the exact configuration during the accident sequence. 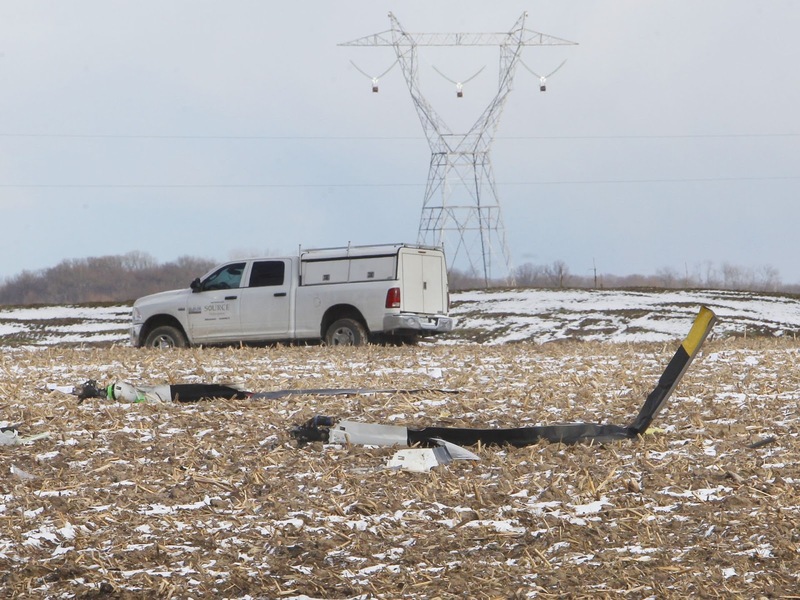 Evidence from the accident video and witness statements revealed that the weather conditions consisted of an overcast cloud layer, light and intermittent snow, and wind gusts of unknown speeds reported by witnesses. One witness reported that he was sitting in his truck facing west at the intersection of the adjacent county roads. His windows were down, and he felt a gust of wind at the time of the accident. The helicopter's fuselage came to rest on its left side (figure 5), the same side as the pilot's seat. The aft section of the tailboom came to rest about 5 ft to the north of the fuselage. The main rotor blades separated from the rotor hub and came to rest to the south of the fuselage. The tailboom exhibited blue transfer marks, and the long line sheath was entangled in the tail rotor assembly. The horizontal and vertical stabilizers separated from the end of the tailboom. The lower portion of the blue long line was entangled in the main rotor hub and extended over the right side of the fuselage and right skid toward the tailboom. The grappling hook remained attached to the long line and was partially embedded in the soil. The long line was separated in tension overload near the top of the line, a few feet from the cargo hook. 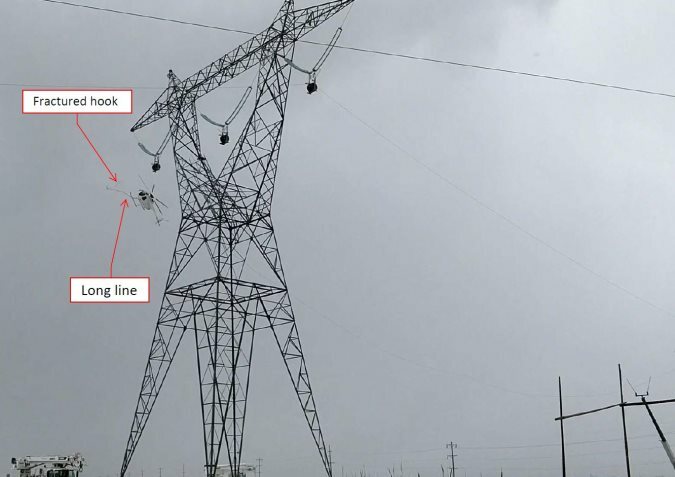 Figure 3 shows the top portion of the long line still attached to the helicopter before the accident and figure 6 shows the postaccident condition of the long line. The cargo hook was found open at the accident site. 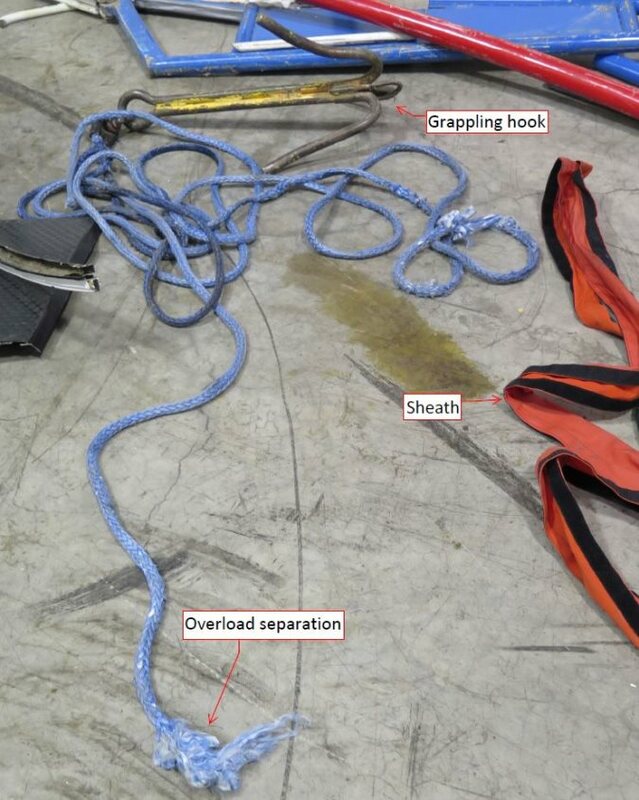 The breakaway swivel, its shear pin, the two carabiners that hooked to either side of the swivel, and the upper portion of the long line were not found during the investigation. The aft end of the needle remained connected to the sock line via a non-breakaway swivel. The needle's fractured aft loop was found about 50 yards south of the accident site. Except for the fracture after loop, the rest of the needle remained intact with ground impact damage. A postaccident test confirmed mechanical and electrical continuity to the cargo hook. The mechanical switch on the cyclic was actuated, and the hook opened as expected. An electrical source was applied to the hook wiring, and the hook opened as expected. The trim switch was fractured from the cyclic stick. The trim switch wires were exposed where they fractured from the trim switch, and electrical continuity was confirmed from the trim switch wires to the trim actuator motors and trim circuit breaker. 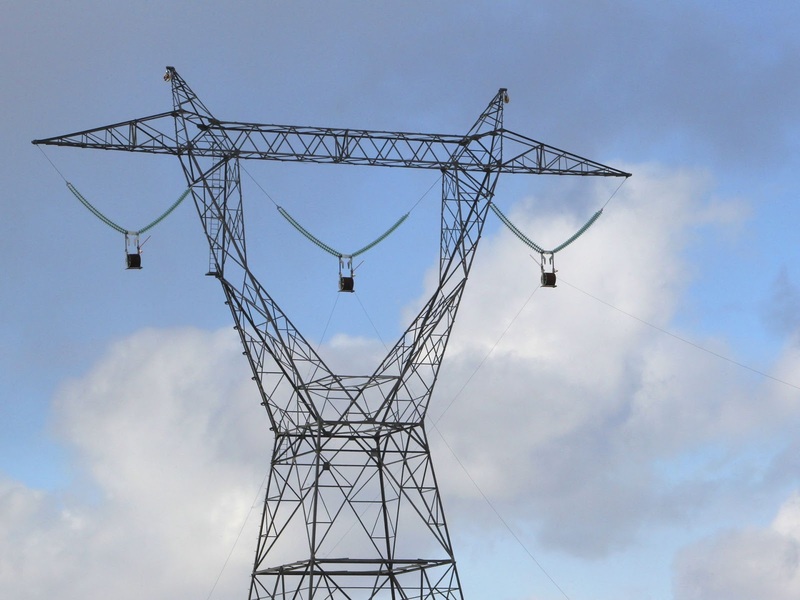 Physical continuity between the wires was also confirmed, and no electrical shorts were found. A portion of the airframe electrical wiring was damaged due to ground impact and did not allow for a complete examination. Extensive examination and a computed tomography (CT) scan of the helicopter's trim system did not reveal any preimpact anomalies. Multiple postaccident examinations of the wreckage conducted by the National Transportation Safety Board (NTSB) investigators with technical assistance provided by representatives from the operator, the helicopter manufacturer, and the engine manufacturer did not reveal any mechanical malfunctions or failures with the engine or airframe that would have precluded normal operation. Central Indiana Forensic Associates, LLC, Fishers, Indiana, completed an autopsy on the pilot and determined that the cause of death was blunt force trauma. The FAA's Bioaeronautical Sciences Research Laboratory, Oklahoma City, Oklahoma, conducted toxicology testing, which revealed no drugs or other substances. 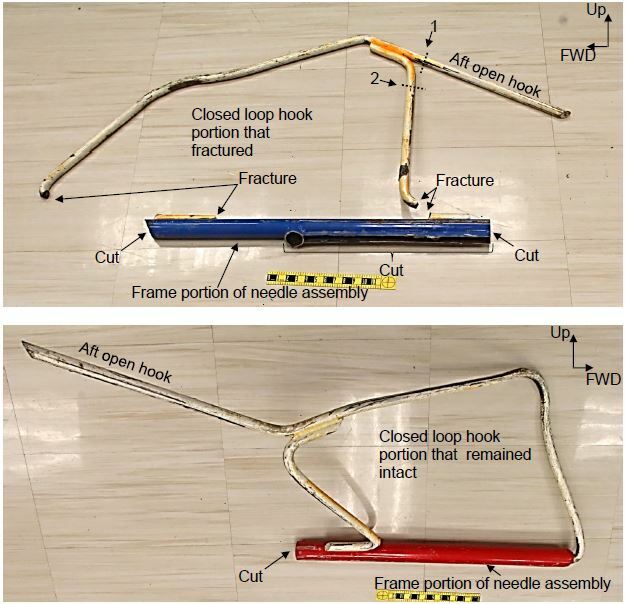 Portions of the damaged needle assembly were sent to the NTSB Materials Laboratory for examination and testing; photos of the as-received portions are shown in figure 7. The needle assembly contained closed loops at the center and the forward end. The top portion of each closed loop also contained an open hook portion that faced aft. A visual examination of the needle assembly revealed that the aft closed loop (the point of attachment of the grappling hook) fractured at two locations. The fractures were through the round solid bar portion and intersected a portion of the weld at the frame portion. A bench binocular microscope examination of the fracture faces revealed rough texture features on slant planes consistent with ductile-bending overstress separation, with no evidence of a preexisting crack, such as fatigue crack. The welds at the fracture face showed no evidence of defects such as porosity. A metallurgical section was made through the loop portions in the areas indicated by arrows 1 and 2 in figure 7 to obtain a 0.3-inch-thick disc portion from the 1-inch diameter solid round bar. Rockwell hardness (HRB) testing of the flat cut faces, perpendicular to the length of the solid round bar, produced average hardness values of 93 HRB, which converted to a tensile strength of about 94,000 lbs. per square inch. The load required to fracture the 1-inch solid round bar from the needle assembly was calculated by multiplying the approximate tensile strength by the cross-sectional area of the solid round bar. The load required to fracture the 1-inch solid round bar under constant tensile load was calculated to be 73,790 lbs., which is nearly 40 times greater than the load required to break the side hook's breakaway swivel shear pin. The video study estimated the orientation of the helicopter during the accident sequence and the orientation and magnitude of the force vector that the long line was applying on the helicopter before the helicopter became tethered to the tower. The maximum amount of force that the long line applied to the helicopter before the helicopter became tethered to the tower was 875 ±130 lbs. The helicopter orientation and the orientation of the long line force vector were documented graphically in the video study, which is available in the public docket for this accident. The video study showed that shortly before the needle first contacted the tower, the helicopter moved backward, and the helicopter yaw angle was about 45° with respect to the tower. In normal operation before the accident, the needle was oriented vertically with the grappling hook attached near the top center of the needle. As the helicopter moved backward, the needle rotated/rolled about its longitudinal axis to a more horizontal orientation. The rotation moved the leading edge of the needle closer to the tower until it contacted the tower and became entangled in the tower's vertical lattice. The helicopter continued to move backward and pulled the needle's aft hook into contact with the tower, which tethered the helicopter to the tower via the long line. The video study revealed that the long line remained attached to the helicopter after the needle impacted the tower. The side hook's breakaway swivel did not appear to separate before the long line became entangled in the helicopter's rotor blades. 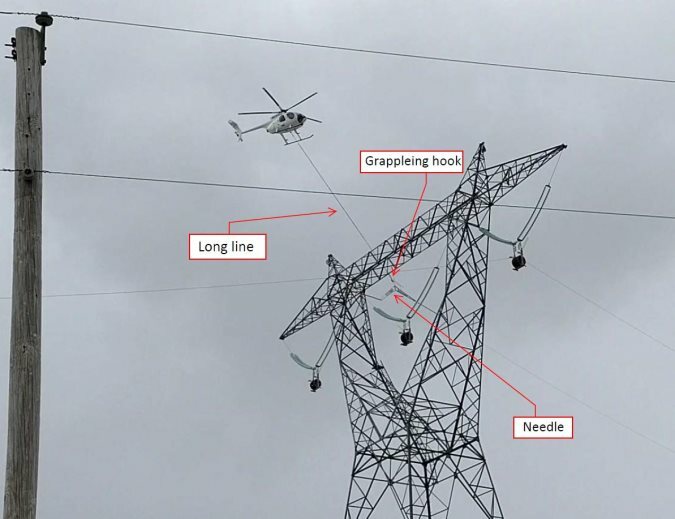 On March 14, 2017, at 1546 eastern daylight time, an MD Helicopters 369FF helicopter, N530KD, impacted terrain during a power line construction flight. The pilot was fatally injured and the helicopter was destroyed. The helicopter was registered to Robin M Rogers and operated by Rogers Helicopters, Inc., under the provisions of 14 Code of Federal Regulations Part 133 as an external load operation. Visual meteorological conditions prevailed at the time of the accident and no flight plan had been filed. The purpose of the flight was to thread a sock line through the tower structure and pull the sock line to the next tower. The helicopter was equipped with a side pull hook assembly and a cargo hook. The cargo hook was attached to a 50-ft long line and grappling hook. The grappling hook was connected to a large metal needle which enabled the pilot to thread the sock line. A witness provided a 3-minute cell phone video of the events leading to the accident and the accident sequence. A preliminary review of the video revealed that the pilot was attempting to initially thread the needle through the center of the tower structure when the accident occurred. At 1535 the automated weather observation station located at White County Airport (MCX), Monticello, Indiana, about 5 miles northeast of the accident site, recorded: wind from 350° at 12 knots gusting to 19 knots, 7 statute miles visibility with light snow, broken clouds at 3,500 ft, overcast cloud layer at 4,800 ft, temperature 27°F, dew point 16°F, and altimeter setting 30.25 inches of mercury. Three witnesses independently reported gusting wind at the time of the accident.